After a whirlwind week of accusations, political sniping and comparisons to rocks, Mayor-elect Patrick Brown’s controversial book had its official debut on Friday, drawing the city’s elite and a host of media to the launch with one burning question: How would Brown execute his duties as mayor after burning so many bridges at the provincial government? Brown’s publisher, Optimum Publishing International, hosted the event in Brampton. 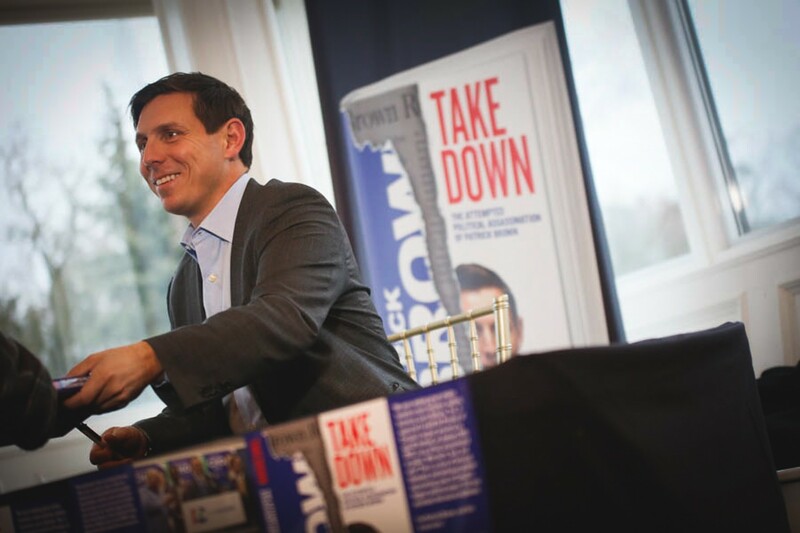 Owner Dean Baxendale said demand for Takedown: The Attempted Political Assassination of Patrick Brown skyrocketed within the 48 hours leading up to the official release. “The story spoke for itself. Let me say thank you to the premier of this province, thank you to Vic Fedeli and Lisa MacLeod, who came out before even having read the material to make statements against it,” said Baxendale sardonically when asked to what he attributes the book’s early success. Carl’s Catering The Glen, the scene of the book’s coming-out party, was a noteworthy venue, as it’s where former premier Bill Davis, whom Brown regards as his political mentor, threw his support behind Brown during the campaign. The book begins with a scene at Davis’s cottage, where the fledgling politician received valuable advice. Davis was not present at the launch, however a veritable who’s-who of the city’s movers and shakers were, including local historian Steve Collie, soon-to-depart Councillor Elaine Moore and former councillor John Sanderson. 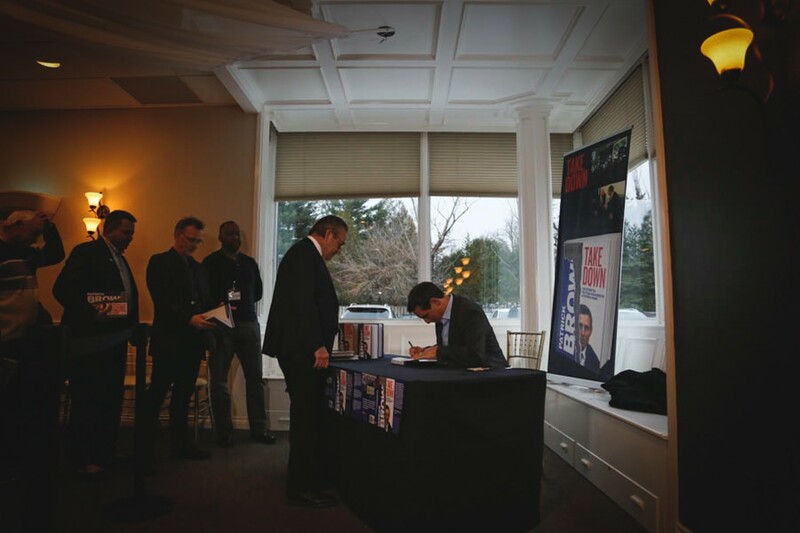 Brown, visibly euphoric standing next to his new wife, kept busy signing copies attendees bought on site, with a line for signatures stretching all the way to the door of the venue. CBC, CTV, OMNI and various Brampton residents crowded around Brown to hear him speak on the potential fallout from his bridge-burning memoir about his ouster from the party caucus last January, on the verge of an election campaign that eventually installed Doug Ford as premier. 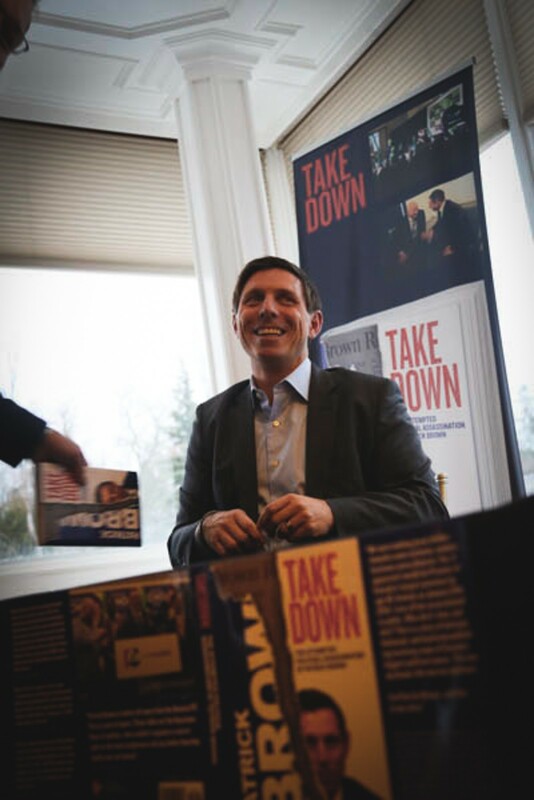 The book is an acid-toned retelling of Brown’s time as leader of the Ontario Progressive Conservative party, and the political rock slide unleashed against him in the hours before he resigned the leadership. CTV reported last January that two women had come forward with allegations of sexual misconduct against Brown. The book describes, with great detail, what Brown believes about the insider machinations against him and a perceived conspiracy to oust him. He focuses his anger in particular toward now Finance Minister Vic Fedeli and Minister of Children, Community and Social Services Lisa MacLeod. “I think that we saw during that interim period when he (Fedeli) was the interim leader and attempting to take over the leadership without an election, that was clearly an example that Mr. Fedeli is a very, very aggressively ambitious individual,” Brown said. The release comes on the heels of a flurry of invective from members of the PC government, particularly Premier Ford, who during question period on Thursday attacked Brown as lacking credibility. “Serious allegations from Patrick Brown? You gotta be kidding. With zero credibility, you actually have the nerve to actually come in here and throw accusations of a person that attacks people that come out and say they have a mental illness issue?” Ford said, referring to comments Brown makes about MacLeod in the book. The outburst was Ford’s answer to Andrea Horwath, who implored his government to investigate Brown’s assertions in the book that a female PC party staffer had made sexual misconduct allegations against Fedeli that were not properly dealt with. “Patrick Brown has as much credibility as a rock,” Ford said, summing up his disdain for the man shaping up to be his political rival. MacLeod released a statement earlier this week defending the government under the PCs as a positive place to work. “The work environment at Queen’s Park, under this administration, is one that is supportive, inclusive and respectful,” the statement said. “Shining a light on what happens within a political party — within a caucus — is important,” Brown said at the launch. “Lifting that veil of secrecy I think is one of the reasons why this book is such a success." Brown remains defiant against the PC government and maintains that Bramptonians have given him a clear mandate to act in their interest regardless if members of the party are circling around him. “What I heard loud and clear from the residents of Brampton during the municipal campaign was to stand up and to fight for Brampton,” he said.